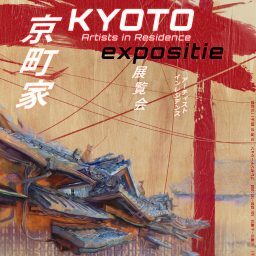 Time to post a new painting from Japan… but first up breaking news: This and my other works from the Kyoto Art Residence will be at an exhibition in Amsterdam soon. Starting on the 2nd of March in ‘t Japans Cultureel Centrum with talks by us three artists that went there. It will stay open until the 30th of March. I’ll update with the flyer and all details in a week or so. Lot’s to prepare still. 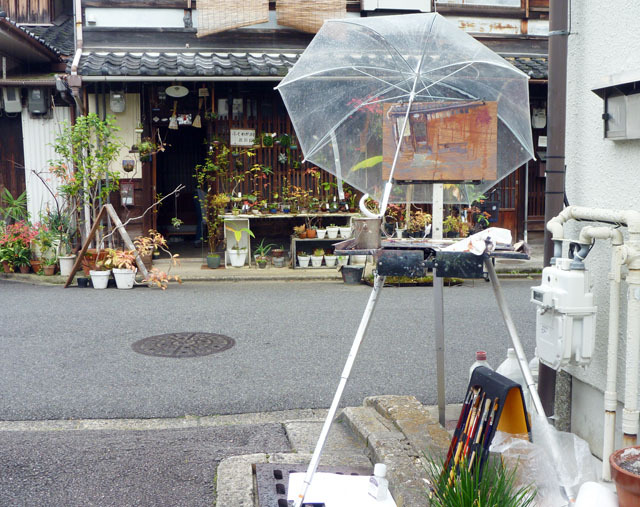 For now, here is another artwork of one of the Machiya – it’s a little Bonsai shop in one small street. 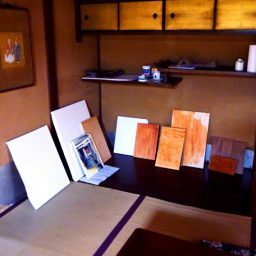 I was quite scared to start painting, I don’t want to disturb customers. Even though communication with the owner was tough for me (he was quite young, but English-speakers are still rare in Japan), it turned our really nice: I got supplied with lots of coffee. That was well necessary, at the last session I was since two nights without sleep. My setup outside the shop. Well prepped for the rain! … and I even got a look inside. And back out again…. 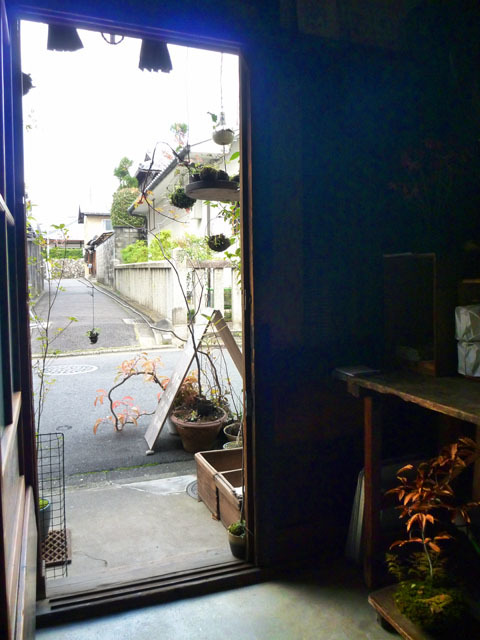 If you’re ever in Kyoto, it’s worth checking the “Fukuwaka Dou” bonsai shop out. It’s in a very nice area – with a big shrine right opposite. 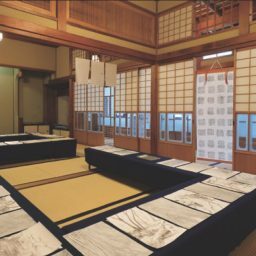 I had thought a lot about how Japanese seem to handle beauty differently… and here it really struck me. Something I’ll talk about in my speech at the exposition. Not only were the house, the location and the (somewhat unusual) Bonsai beautiful – but even the tools. As a typical German you would only find the newest and most effective tools, I felt that these were quite different – chosen for their character. I’m not sure… but interestingly the owner took pictures of my setup for his blog. And he also seemed fascinated by the tools of my trade. Something I didn’t pay much attention to, beyond utility. That’s why I really enjoyed this trip to the other side of the world – it gives me a different perspective, even on the tools I carry around daily. 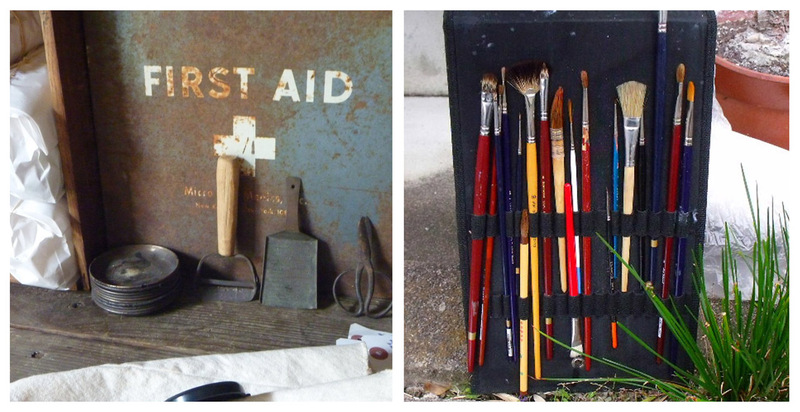 The tools of the shop, and the picture of mine.